The folk of the town of Schtettel storm the local castle to destroy the vampire Count Mitterhaus, but as he expires he curses the town, foretelling that it and its children will die to give him back his life. Shortly afterwards, a plague-like illness descends on Schtettel claiming many lives and giving rise to thoughts that the curse is beginning to come true. Then, into this grim situation comes the Circus of Nights, a travelling troupe of performers and animals. 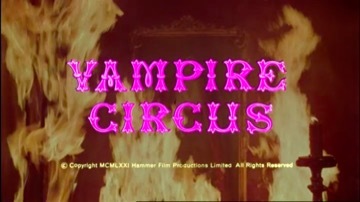 At first the townspeople welcome them, pleased to have a diversion from their woes, but it soon becomes clear that this is no ordinary circus, but one with strange and terrifying powers, summoned to the town to help fulfil the dead Count’s prophecy. Actress Lynne Frederick later married comedy actor Peter Sellers. Lalla Ward married actor Tom Baker after first appearing with him as a fellow Time Lord in BBC TV’s “Doctor Who”. Producer Wilbur Stark was the father of actress/model Koo Stark, who created headlines by having an affair with Prince Andrew. Laurence Payne’s part was originally meant to be played by Anton Rogers, but he had to pull out at the last moment owing to illness. This film has the longest prologue of any Hammer film, which, at twelve minutes, is almost as long as one of the Company’s earlier featurettes!